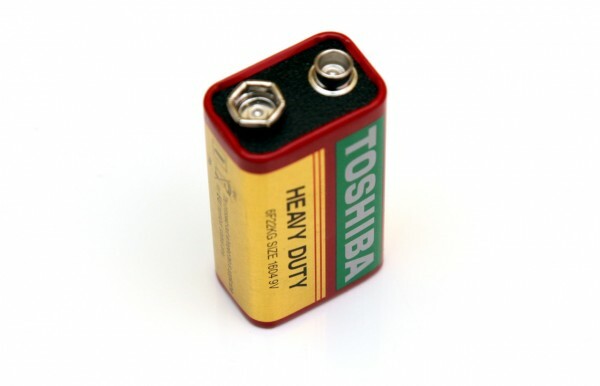 The 9V Toshiba Heavy Duty batteries we are testing here are essentially lower capacity Zinc batteries, even though they are not labeled as such the Heavy Duty in the name points exactly to that along with the lack of Alkaline anywhere written on the battery. These batteries are often found in supermarkets for example and are relatively cheap, so you can often make a mistake of taking them if you need a 9V battery for some device. And while nowadays 9V batteries are not so commonly used, there are still a lot of devices that need them and it is a wise idea to spend your money on something better that will last longer. The particular battery we are testing here is with an expiration date of 01-2016 and according to Toshiba these batteries are suitable for slightly heavy duty to light duty applications such as flashlights, radio cassette recorders and clocks. In order to test the capacity of the 9V Toshiba Heavy Duty batteries we are using a constant current discharge rate of 0.05A (50 miliampers) and we have managed to get just 4 mAh out of the Toshiba battery. No, that is not a mistake, it simply means that our test discharge current seems to be a bit higher for these batteries and they simply cannot handle it well. So much for recommending these over any other Zinc batteries as we usually should get about 100-150 mAh as useable capacity in our test scenario under these conditions. In fact we have managed to get more useable capacity out of a Carbon Zinc battery that has expired already than what this new Toshiba battery has managed to provide. At a lower loads the battery should probably handle better and be able to provide higher useable capacity, however that does not make it things any better – in short we are very disappointed from the result.